Literary Hoots: Awesome 8: 50 Picture-Packed Top 8 Lists! Awesome 8: 50 Picture-Packed Top 8 Lists! "Curious kids who want to know the who/what/where of the coolest things on the planet will welcome this first book in an awesome new National Geographic Kids series. Every turn of the page presents a different theme and counts down the greatest of the great top 8 of its kind. 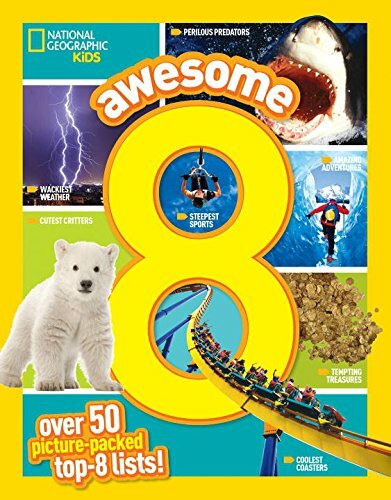 For example: The Awesome 8 Coolest Coasters, Haughtiest Hotels, Wicked Water Slides, Perilous Predators, Remarkable Ruins, Weirdest Wonders, and anything else you can imagine. It's truly something you have to see to believe—which is why the entire list appears in photographs, layered with fun facts and insightful stories." Wow. That was a lot of randomness. On the one hand, I really appreciate what these kinds of books have to offer: enticing photos, cool facts, a range of information, engaging graphics, and a pick-what-you-like format (as the authors say up front, no need to read front-to-back—especially with a rather comprehensive index in the back). Kids love these! There's just so much packed into one book, but so shallowly presented that just about anyone can find something they like. On the other hand, however, that shallow information presented so randomly just about kills me. The eight in each category, while fascinating, don't always seem to be the "best of" and aren't really put in any particular order. Though, I will admit each list does still give enough of a taste that kids can do more research in a specific area, if they so choose. A small taste. A lick. Really, it's for those with short attention spans, am I right? So, why I would still recommend this book for perusing, just know that it is not by any means in-depth or straightforward. In other words, many kids will love it. See what random information you can learn!